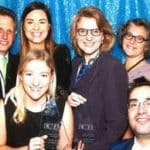 The Legal Marketing Association (LMA) Your Honor Awards program recognizes excellence in legal marketing by promoting projects and programs that provide innovation and return on marketing dollar investment. The LMA Eastern Canada’s fifth annual Your Honour Awards Gala event, held on November 21, 2017, was a very special evening highlighting the outstanding achievements of our legal marketing community in 2017. Competing against biggest and best Bay Street firms, Howie, Sacks & Henry was proud to be recognized for our work in two categories. We won top awards for Advertising and Niche Microsites and Blogs. HSH was proud to be honored by our peers as winner of the 2017 Advertising Award for our “Badges of Honour” campaign. As one of Canada’s top ranked boutique personal injury firms, Howie, Sacks & Henry has been recognized by Canadian Lawyer Magazine as a top Personal Injury boutique in every survey since 2011. We consider this achievement as “badges of honour”, humbled that our peers continue to recognize our credentials to help the critically injured. Only a handful of firms share this distinction which we use to promote as our point of differentiation in a crowded marketplace. This is the second win in Advertising for our firm; in 2015 our”Life Isn’t Cheap” campaign won the top award for Advertising. We created our Hernia Mesh campaign to raise awareness of the dangers of defective hernia mesh for Canadians. The campaign included a microsite, online and television advertising, informational blog posts, and a community support page on Face Book. Visit www.herniameshlawsuit.ca.